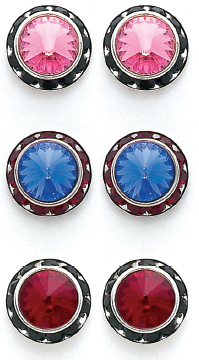 All of our performance earrings are Swarovski Crystals! How do you pronounce Swarovski? Swarovski Crystal is considered by many people to be the finest quality, full-lead crystal made today. It contains a minimum of 32% lead oxide, making the crystal optically very pure. The crystal is then faceted with tremendous precision, creating beautiful prisms. Brilliant colors and/or coatings are added to these crystals to create pendants, stones, and beads of dazzling beauty in a variety of shapes and sizes. 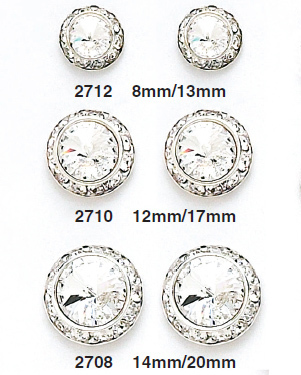 Swarovski Crystal is unmatched in quality and distinction. 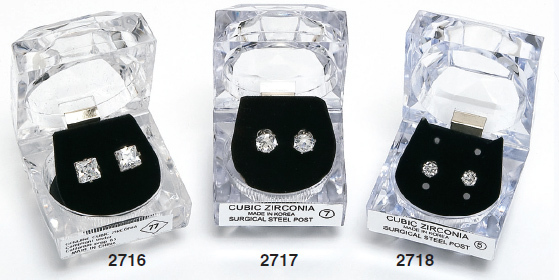 Our new Swarovski Solitaire earrings 2709 are 14mm and available in 8 different colors. Style 2708 is post only. "glitz up" your dance stars!